Harrisburg University today announced that it has selected a city-based company as its hotel partner for the 17-story mixed-use building it plans to construct in downtown Harrisburg. HHM, also known as Hersha, has its headquarters on Front Street in Harrisburg. 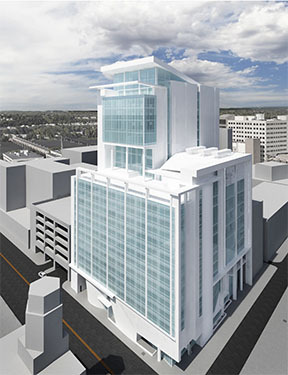 It will operate the 197-room hotel attached to HU’s academic tower at S. 3rd and Chestnut streets. HU plans to break ground in July on the $135-million project, which will include a restaurant in addition to the hotel and academic portions. The educational space will house as many as 1,000 students and a health science education center for nursing, pharmaceutical sciences and other health-related programs. It also will have classrooms and training space for advanced manufacturing and interactive media programs. The 386,200-square-foot building (rendering above) is expected to take two years to complete, opening in time for the 2021-22 academic year. The hotel is expected to open at the same time as HU’s academic portion, Darr said. The hotel will front Chestnut Street, and the hotel and academic portions of the building will be separated by an atrium in the first 10 stories of the building, according to HU. The three portions of the building will be owned and financed separately, Darr said. The university will own and finance the academic portion, estimated at $100 million. HHM will own the hotel, projected to cost $33.5 million. The restaurant, expected to cost about $1.5 million, also will be owned separately, he said. HU has not yet announced a restaurant operator. HHM operates about 125 hotels across the United States under a variety of hotel brands, including Westin, Hilton and Hyatt. In March, the project received approval from the Harrisburg Planning Commission. Its land use plan still must be approved by City Council, which should take up the issue in late April or early May, Darr said. For more information about HHM, visit www.hhmhospitality.com.